Schleiermacher is a name new to me. Based on research I’ve made, as well as the helpful liner-notes, Schleiermacher, a composer and pianist, was a presence in the music scene of Leipzig in the 1980s, where he acted as an assistant in ear training, composition and new music at the Felix Mendelssohn Bartholdy Academy of Music. From there he moved on to freelance composition. His performances of piano music focus exclusively on music of the 20th (and now, I am assuming, the 21st) century. He also founded the Ensemble Avantgarde, a Leipzig-based group that focuses on unsung composers, especially those who have fallen between the cracks, such as those of the French and Russian/Soviet avant-garde of the 1920s and 1930s. 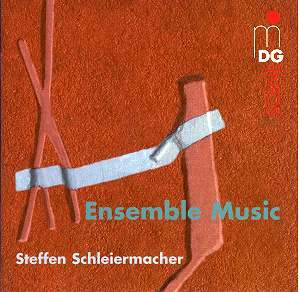 The disc opens with a piece for ensemble and pre-recorded tape, Auto Werk mit Hup Raum. Commissioned by BMW, the intent, according to the composer’s note, was to replicate the noises and atmosphere of a state-of-the-art auto factory, such as the one where this piece premiered in Leipzig. The original idea, once work was underway, was to use Mossolov’s Iron Foundry as a model. Upon visiting the factory, the composer found little there to suggest the motoric whirling of that earlier piece. This new work takes us through the assembly line, beginning with synthesised metallic clangings as the brass provide occasional fanfares. The work as a whole tends to rely rather heavily on the pre-recorded tape, but certainly holds interest in its ability to portray a space not often accorded a musical portrait. One hears engines starting, seat-belt buckles being tested, alarm beeps, and, from the brasses, car horns being given occasional tentative blasts. Obophon found its genesis through a conversation of the composer with an acquaintance oboe-player, during which came a discussion on the lack of oboe ensemble music. The piece begins with a solo oboe, which holds a prominent position throughout, bending its pitch often as the accompanying oboes make their entries with quiet trills. The piece maintains an atmosphere of tension throughout; an overall dark suspension, especially around the ten-minute mark, with a stretch of a held E-flat, with the various members of the ensemble dovetailing seamlessly to continue the note as others’ air gives out. On a smaller scale, we have the Three Pieces for Viola and Bass Clarinet written separately between 2003 and 2005, intended as birthday presents for Volker Hemken, a bass-clarinettist whose wife happens to play viola, thus the unusual instrumental combination. The first piece, entitled Streit Fall (Quarrel) certainly is that, with carping from each instrument, both talking past each other as tempers rise, with a rather humorous ending escalation that some married couples can relate to better than others. Following that is Hochzeit (Wedding) which certainly does not begin auspiciously, but rather seems to rise out of a drugged silence, as does the closing piece, Schei-Dung (Divorce) — strange birthday presents, these … These last two pieces hold real drama where the first makes a less serious attempt at it. The combination of timbres is quite interesting and less forced than my initial fears on first looking at the track-listing. Composed for the consecration of the reconstructed organ of Merseburg Cathedral, we have the Merseburger Overtüre mit F. L. Interestingly, Schleiermacher mentions that Liszt composed his Prelude and Fugue on B-A-C-H for the original consecration of that same organ in 1855. This piece is a continuation of sorts - the F. L. stands for Franz Liszt - in that tradition. Schleiermacher refers to it as a “remorseful bow”. It is also a celebration to the organ builder, Franz Ladegast, who coincidentally shares the same initials. Liszt quotes are sprinkled throughout. About five minutes into the piece, the stops are opened to show what the organ is capable of, and the dissonant chords are represented beautifully in this recording. The Glockenspiel stop is used here to advantage, in a stirring way, almost halfway through the piece. The work does impress, and at times is rather arduous listening for those who come to organ music in search of identifiable melodies. As a celebration, the only hint in that direction is the crashing major chord about a minute from the end of the piece; the coda evaporates into air with no resolution. The closing Netz Werk of 2002, came into being, unusually, to commemorate the retirement of a chairman of the Max Planck Society. The honoured retiree, Hubert Markl, studied networks and interrelations, which became the basis, according to the composer, of the piece. Occasional phone bleeps and rustlings are heard from the pre-recorded tape used to augment the live instrumental forces here, and soloists pick up where others leave off, the held note of one passing to the other like a baton. There is little by way of resolution throughout the piece, as we progress, somewhat like Auto Werk, through a series of stages, both loud and quiet, until, toward the end, with rushing wind noises and telegraph beeps, the piece ends abruptly. The disc as a whole is performed quite well and the sound quality certainly is not inferior — the music itself may puzzle some, but for those who are new music enthusiasts, this is certainly worth a listen.